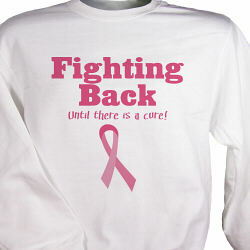 Wear this sweatshirt to show your support of breast cancer awareness. Help fight back until there is a cure! It is availablem on premium white, ash gray or pink cotton/poly blend and is machine washable. Available in adult sizes S-3XL.